Neoclassical style, with its strong proportions, symmetry, columns, and pediment, would fit the bill, and the venerable firm awarded the design contract for the new bank, McKim, Mead, and White, was well prepared to satisfy the building committee's entreaty. One tricky aspect of the design and construction on this site was that there was (and still is) an existing six-floor building at the northwest corner of Bowery and Grand. The bank owned the adjacent lots on either side of this Renaissance Revival building, and McKim, Mead, and White delivered an L-shaped design with dignified façades on both streets. The photograph here shows the side facing the Bowery, where the architects provided a monumental, coffered arch entrance flanked by a Corinthian column on either side. The entablature that sits on the columns includes a frieze with the bank's name in the center and otherwise decorated with vines and leaves. The pediment above includes a large clock with an allegorical figure and a domesticated lion on either side, sculpted by Frederick MacMonnies. I've read that the figures represent Time and Industry, which are appropriate enough for a bank. But while "Industry" has a forging hammer, I don't see an hourglass or similar item with "Time," so I'll keep looking for another explanation. The façade on the Grand Street side is wider and features four Corinthian columns that hold up an entablature and pediment identical to the one on the Bowery side. In 1923, the bank built a larger and quite impressive new headquarters in Midtown at 110 E. 42nd Street, but continued to do business at the Bowery location until 1982. 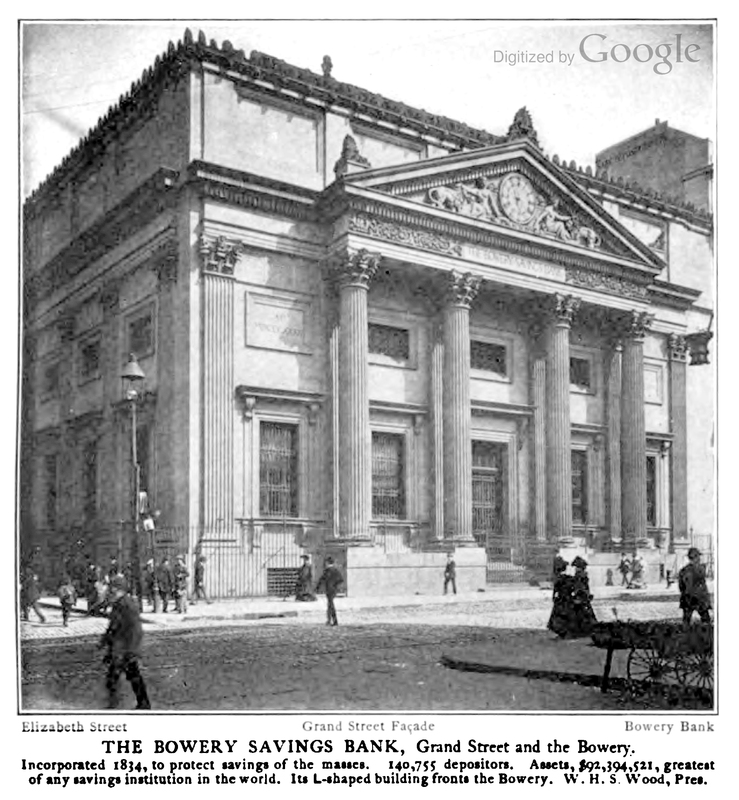 The Bowery Savings Bank eventually lost its identity via some mergers and acquisitions in the 1990's and 2000's and is now part of Capital One Bank. Since 1992, the building at 130 Bowery has been owned and operated by Capitale as a high-end banquet and events venue. The E. 42nd Street headquarters is also now a similar venue, owned by Cipriani. Both buildings are landmarked, and their respective owners have done a praiseworthy job of investing in the restoration and upkeep of the interiors and exteriors.